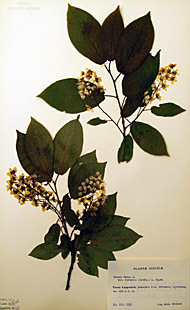 Botanical specimens in the collections of the Museum of Evolution. Herbarium UPS includes approximately 3,120,000 objects, 790,000 of which have been digitized so far (February 2017). Digitized objects include vascular plants, fungi (incl. lichens), bryophytes, and algae. Thunberg's Japanese Plants - an image database. This database contains high resolution images of all Japanese specimens in Carl Peter Thunberg’s herbarium at the Museum of Evolution. Zoological specimens in the collections of the Museum of Evolution. Only a fraction of the collections have been digitized so far. Santesson's Checklist of Fennoscandian Lichen-forming and Lichenicolous Fungi. Svensk Kulturväxtdatabas. Nomenclature of cultivated plants in Sweden. SKUD reopened on the 28 September 2012.